SpaceX’s next mission is moving into the business end of its pre-launch flow with the next Falcon 9 conducting a Static Fire test at Cape Canaveral’s SLC-40 on Sunday. 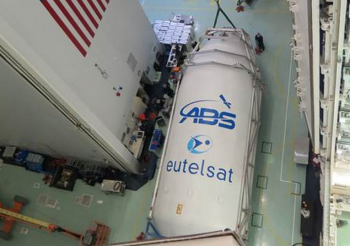 The SpaceX workhorse is tasked with the dual launch of the Eutelsat 117W B and ABS 2A satellites “No Earlier Than (NET)” June 15. SpaceX is also working towards the historic reflight of a recovered Falcon 9 first stage this Autumn. The dual satellite launch Eutelsat 117W B and ABS 2A will mark the completion of a busy salvo of successful commercial satellite missions for SpaceX. Following this launch, SpaceX will take a short break of around a month before a mid-July mission involving the launch of the latest Dragon mission to the International Space Station (ISS). 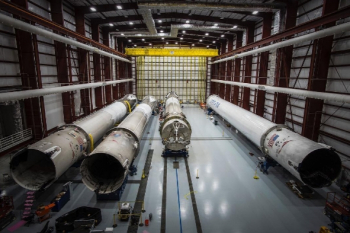 The CRS-9 mission is scheduled to launch on July 16, pending the completion of flow milestones and the usual considerations relating to the Station’s Visiting Vehicle manifest. SpaceX’s next mission comes just a few weeks after the successful lofting of the Thaicom 8 satellite. 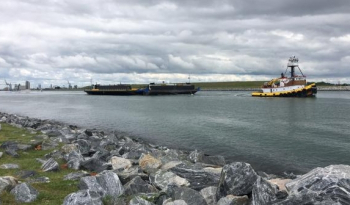 A clear sign of SpaceX’s schedule intent was the sight of the next Falcon 9 booster arriving at the launch site within hours of the Thaicom 8 launch. 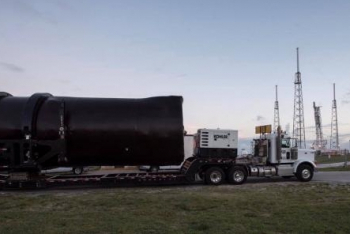 Prior to the road trip to Florida, the stage had successfully completed its testing flow at the SpaceX test site in McGregor, Texas. 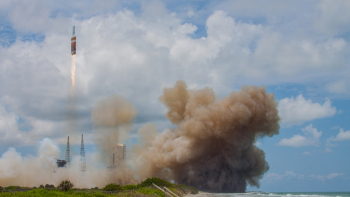 While the Texas testing included the firing of the stage’s nine Merlin 1D engines, a key milestone towards confirming the rocket is ready for its launch day is the Static Fire test at Cape Canaveral’s SLC-40. Numerous requirements have to be successfully proven via the test, such as the engine ignition and shut down commands, which have to operate as designed, and that the Merlin 1D engines perform properly during start-up. While also serving as a full dress rehearsal for SpaceX’s Cape launch team, the data from the test feeds directly into the Launch Readiness Review (LRR) that officially confirms the launch date. The Static Fire test was apparently completed on Sunday, with the launch date now manifested for June 15. However, only the latter has been confirmed by SpaceX as of late on Sunday. The company usually tweets confirmation of a good static fire test. However, this time, it took until Monday for SpaceX to inform media that the test was completed over the weekend (likely early on Sunday). The launch date is a slight change to the schedule that initially showed the target for the Static Fire as Friday, with the goal of a June 14 launch date. The flow became convoluted when ULA’s Delta IV-Heavy failed to launch on its initial launch date of Thursday. The NROL-37 mission then stood down until Saturday due to SpaceX holding the Eastern Range assets for the Static Fire on Friday. 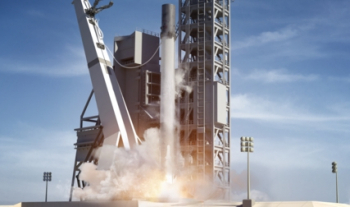 However, the SpaceX test was subsequently postponed, with no official reason provided. With the Delta IV-Heavy now off her SLC-37 pad following Saturday’s successful launch, SpaceX was able to confirm the new launch target late on Saturday, which had already been approved as a backup date on the Eastern Range. The launch window for Wednesday’s attempt opens at 10:29 Eastern and is available through to 11:13. The latest weather forecast shows favorable conditions for the June 15 target, with only a 20 percent chance of violating launch weather constraints. The launch will mark only the second time the Falcon 9 has been tasked with a dual satellite launch. Notably, that debut success involved Asia Broadcast Satellite’s ABS-3A spacecraft, and Eutelsat 115 West B for French telecommunications company Eutelsat. As such, this next launch is a direct follow-on mission for both customers. 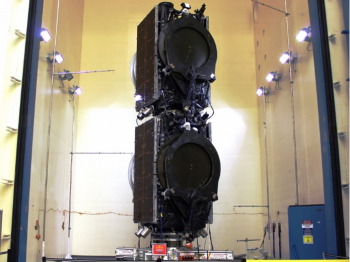 As with the previous launch, both satellites are based on Boeing’s new BSS-702SP bus. The 702SP has a significantly reduced mass compared to its predecessors, enabling two spacecraft to be launched at the same time by rockets in the Falcon 9 range. The mass savings are mainly found via the use of electric propulsion for orbit-raising. Most geosynchronous spacecraft use chemical propulsion to power an apogee motor. There will also be additional margin available via the rocket, with this being the first dual satellite launch to be conducted by SpaceX’s upgraded Falcon 9. The previous launch involved the Falcon 9 v1.1. The extra performance will also aid the Falcon 9 first stage’s attempt to return home after staging. SpaceX has achieved what is now four successful landings, one at its LZ-1 landing pad at Cape Canaveral and three on the ASDS. The latest stage to make it home was the Thaicom-8 first stage. On Friday, the ASDS and its support ships were spotted heading out into the Atlantic for next week’s mission. Once again – due to the additional stresses of returning from a GEO mission profile – the stage is not expected to successfully touchdown on “Of Course I Still Love You”, with the previous success another surprising bonus in the company’s continued reusable rocket aspirations. With four boosters already recovered, the new Horizontal Integration Facility (HIF) at SpaceX’s Pad 39A is providing a fascinating insight into its future role, which will be mainly for the pre-launch preparation of Falcon Heavy and Falcon 9 rockets at the Kennedy Space Center. The HIF is designed to host as many as five first stages, although the prospect of seeing that become a reality in the next few weeks is unlikely. That’s because the first recovered booster, from the OG-2 mission, is in the final stages of preparing to depart the 39A HIF for its trip to SpaceX’s HQ in Hawthorne, California. As shown in a SpaceX photo, that stage is in the process of being cleaned ahead of the trip back to its birthplace, where it will go on display. While the recovered booster from the JCSAT-14 mission is expected to play a major role in “ground testing”, the recovered CRS-8 core – involved with the first successful ASDS landing – is currently understood to be the stage that will be tested and prepared for what will be another historic first. Elon Musk updated the status of this potential milestone by citing “September or October” as the current launch target. The stage will still need to pass a series of test firings, set to take place at either 39A or at the McGregor test site. Meanwhile, SpaceX has noted a number of customers have shown interest in riding on the historic mission. However, specific names and details are yet to be revealed.